Home » For Sale » Homeschool (Books to Read) » Homeschool (Forsale) » Homeschool (Printables) » Homeschool Teaching Helpers » Paddle-to-the-Sea » Paddle-to-the-Sea - Literature Study - Learn Geography and So Much More! 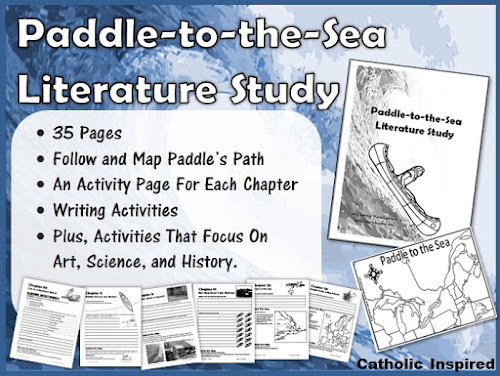 Paddle-to-the-Sea - Literature Study - Learn Geography and So Much More! Several years ago I posted about the Paddle-to-the-Sea Literature Study which I created for my older children. My older kids enjoyed reading Paddle-to-the-Sea so much that I want to read this book with a few of my younger kids this school year. So I thought it might be a great time to sit down and update the file! Not only did I update the pages with a better map and more detailed information, I also added an activity page for each chapter which includes questions to answer and activities to do. These pages also have loads of images and ideas that focus on the chapter's topics! 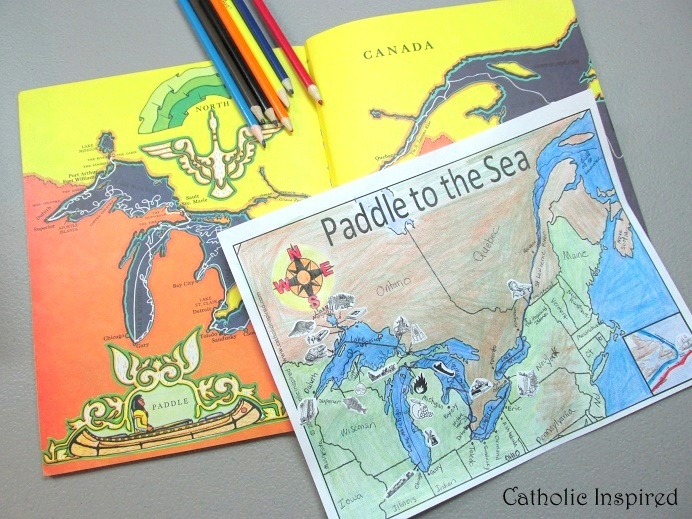 This literature study is a companion to the book: Paddle-to-the-Sea by Holling Clancy Holling, which is a wonderful book that teaches kids about the Great Lakes area and all the amazing business, cities, and sites that lie around the Great Lakes during the early 1900's! The journey is seen through the eyes of Paddle, a little hand-carved wooden Indian in a canoe. As you journey with Paddle you will fall in love with this story and cheer him on as he travels to the ocean! The literature study is a 35-page ebook for children - grade levels 4 to 6. 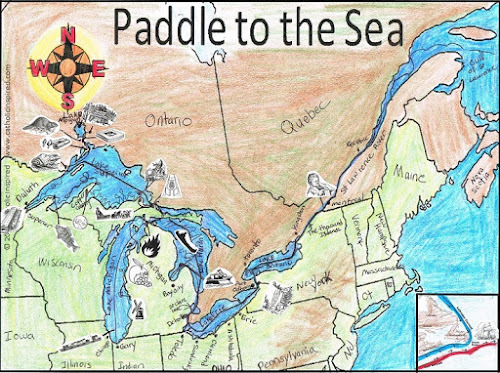 This study is meant to help children follow what happens to Paddle and record what Paddle passes while he takes his long journey. As you read the book, you will discuss the areas he is in, how long it took him to get there, and what season it is. Then glue the images to the appropriate spot on the map. The children will also create a map key that tells what each image symbolizes. They will create a story timeline to show the season and year in which the events happened. Teachers use the teacher-examples to help you teach the student(s) how to complete the map and key-timeline. Both examples are provided in a separate teacher's PDF. 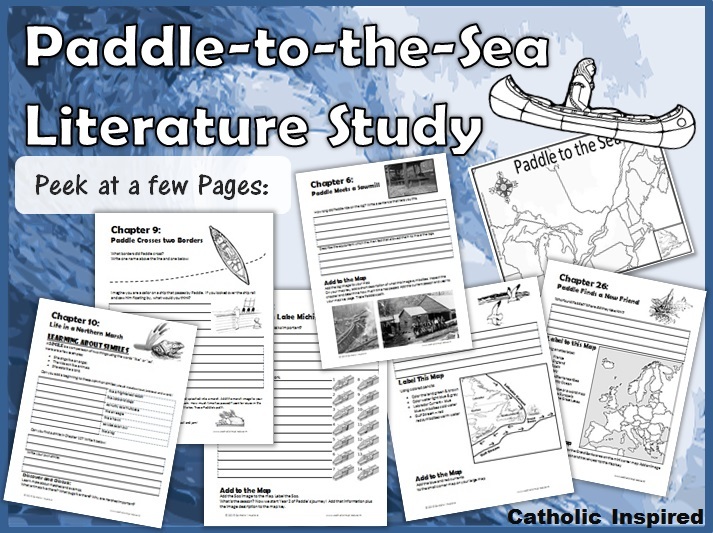 The map on the inside cover of your Paddle-to-the-Sea book as well as an atlas is also a wonderful help when completing this study. The pages will help you focus on different topics of each chapter. These will include geography, writing props, thinking questions, art activities, and science and history topics. Some pages require research; others are creative activities. It’s a variety of ways to learn! Is this a Catholic literature study? Copyright: Feel free to print out as many as you need for a single class or family. Note: The Paddle-to-the-Sea book is not included in this study. I tried to look for the downloadable kit and it's not there. This link does not work to purchase...is there a way to still buy it? Thank you! Sorry, I currently stopped selling this file because I wanted to fix a few problems, as well as, update it. I am currently working to improve it and I hope to have it up for sale again soon. I'll let you know when I have it listed. Thanks for this wonderful resource! I have just purchased it, and it looks fabulous. Can't wait to use it with my kiddos. Just wondering - is there any chance that you're looking at the other Holling books too?? Holling books are a favorite at our house. So it's possible I may create another study for one or two of his books, but I don't currently have anything planned. Only time will tell. Hope your kids enjoy the book!